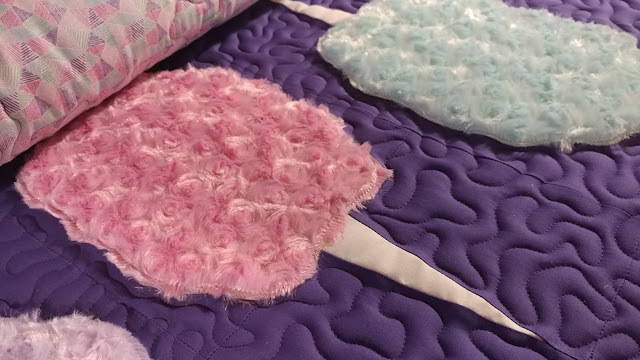 After deciding there had to be a cotton candy quilt, I stumbled upon three different rose minky fabrics at my local Jo-Ann store. They called it "swirl fur," but I knew it was *really* cotton candy! 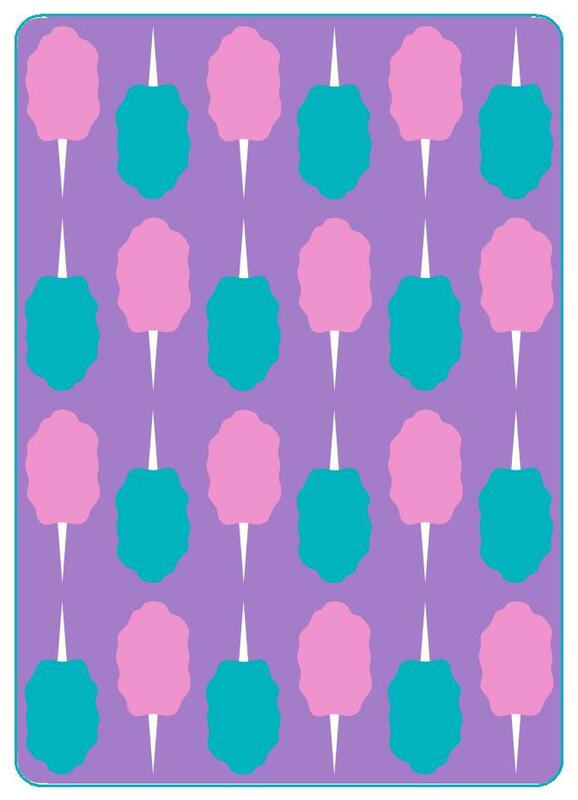 I drew the quilt out in EQ so that I could experiment with different layouts and background color options. (You can see some of those at the end of this post!) 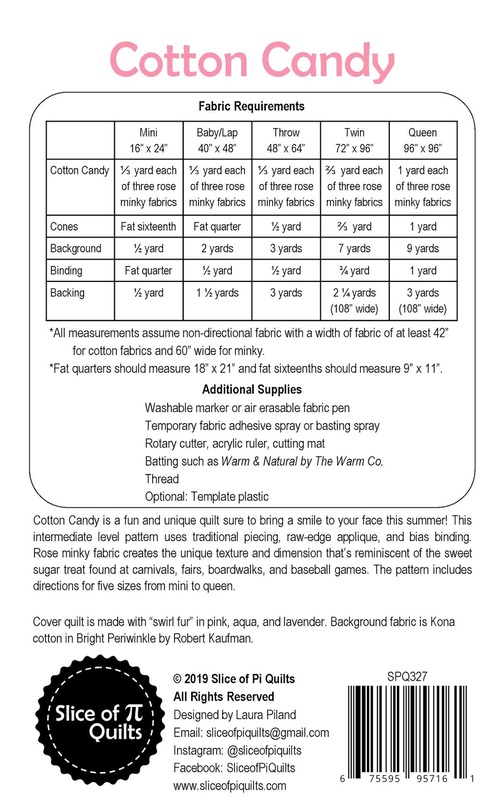 This helped me to decide that the Kona cotton color "Bright Periwinkle" would be a great choice! 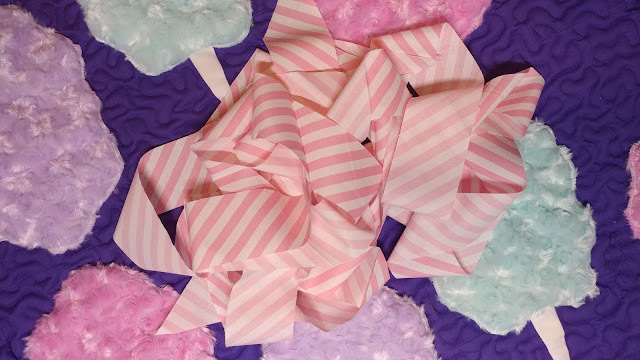 I also knew immediately that I wanted a white and pink candy stripe binding! The pattern includes lots of tips and tricks for working with the minky fabric. It's so easy to use! 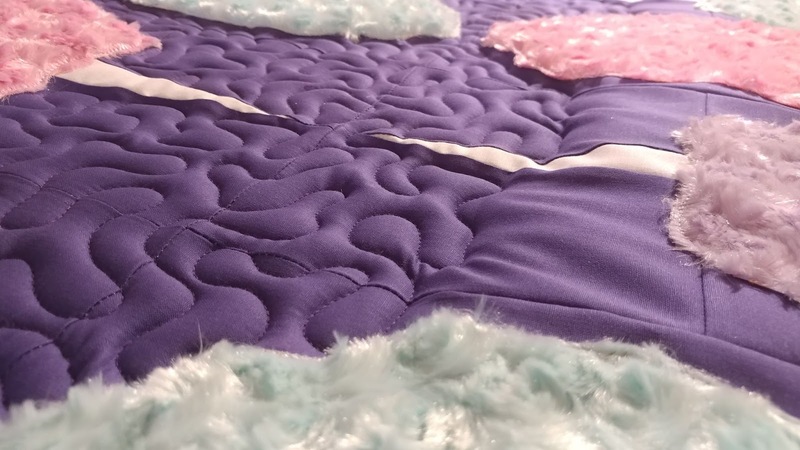 I decided to use two layers of Hobbs wool batting when quilting the quilt. I thought if I would densely quilt the background fabric, that would reduce the puffiness of the batting, but if I left the cotton candy un-quilted, then those would puff up. And it worked! 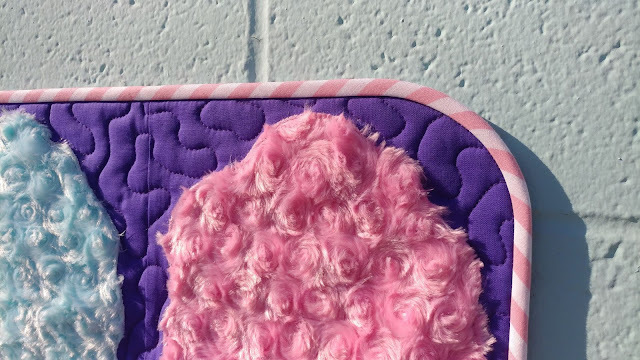 The quilt has so much texture!! The Aurifil thread #4225 Eggplant was a great match! I used 50wt until my spool ran out, then I switched to 40wt! 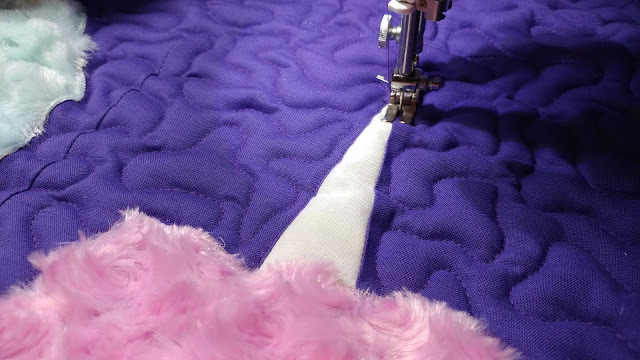 After finishing the free motion quilting, the cones were a bit distorted from all the puffiness of the batting. 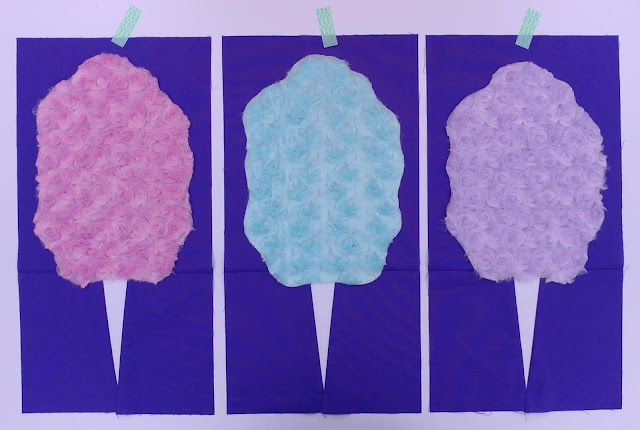 I decided to use my domestic machine to stitch straight lines on the sides of the cones. This really helped the cones to visually look more crisp! I absolutely love how the rose minky fabric really does look like cotton candy! The quilt takes me right back to the carnivals, rodeos, and baseball games from when I was a kid! 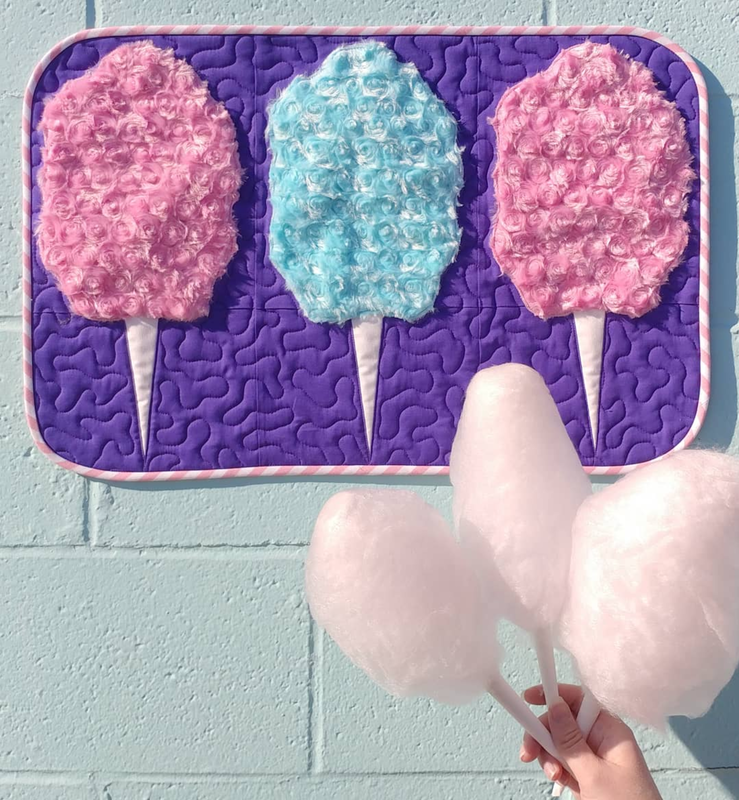 To celebrate the pattern release, Kiffany and I are giving away a Cotton Candy mini quilt and a sample pack of all-natural cotton candy on Instagram! The giveaway starts on Friday (4/5), so be sure to pop over there and enter to win! 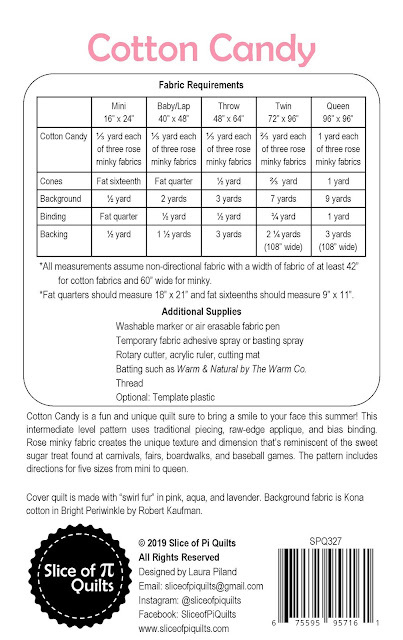 For the mini quilt, I ordered Shannon Fabrics Cuddle Rose in Saltwater and Hot Pink. 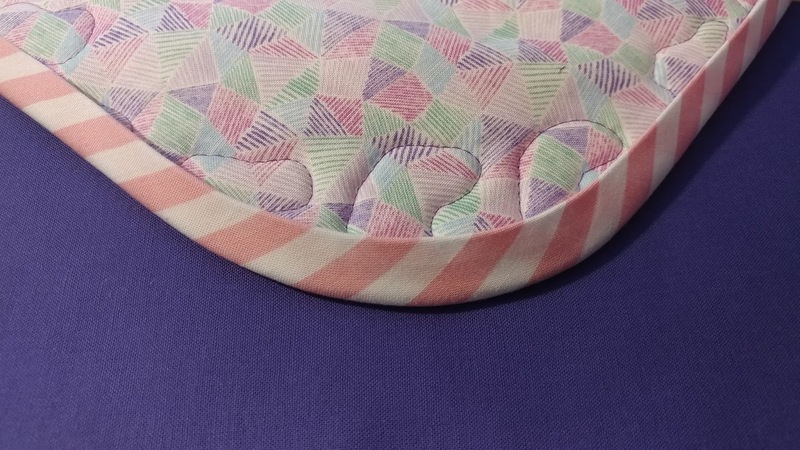 I wanted to use the same Kona Bright Periwinkle for the background and of course pink and white striped binding! The Cotton Candy quilt is one of several new patterns that I am releasing in conjunction with spring Quilt Market. 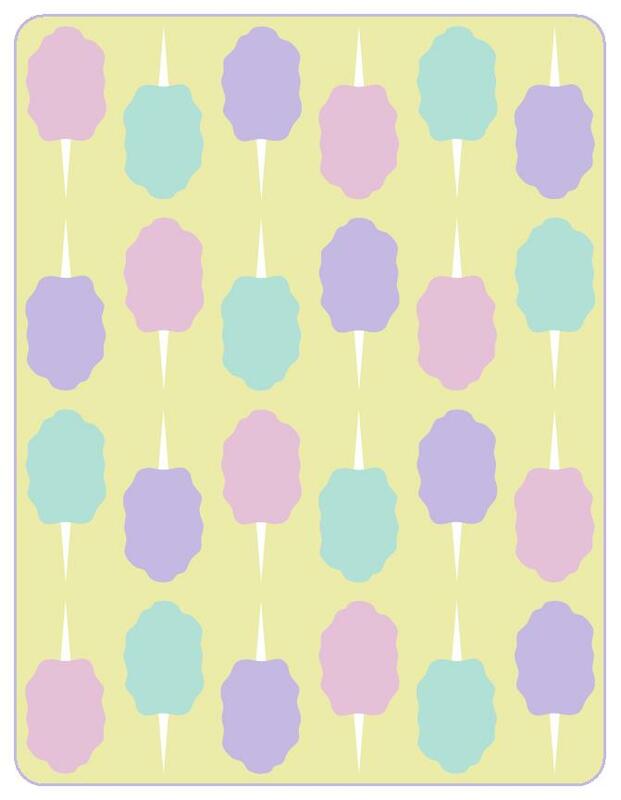 You can get the digital pattern now in my Etsy shop! Paper patterns will arrive just before Market in May. Included in the pattern are several other color suggestions! This yellow version uses the same three minky fabrics as the cover quilt, but Kona's Maize for the background. Same quilt! Just Kona's Sassy Pink for the background! Same fabrics as the cover quilt, but a more random layout for the blocks. Same minky fabrics, but Kona's Honey Dew for the background. And these blocks are all upright. 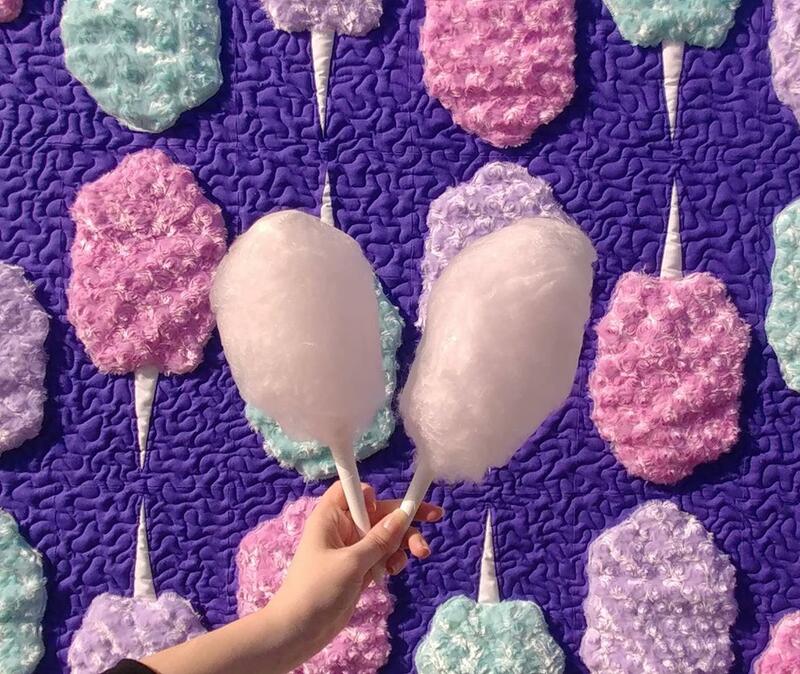 Looks just like a stand of cotton candy at Silver Dollar City! This one uses Kona's Pond for the background, and three different shades of pink for the rose minky. 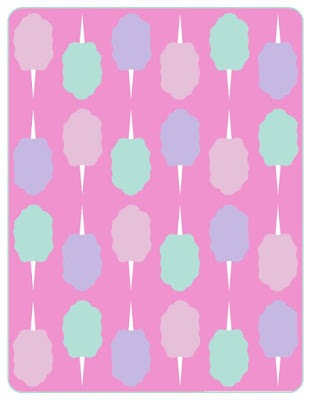 Shannon Fabrics has Rose Cuddle in Paris Pink, Hot Pink, and Baby Pink. 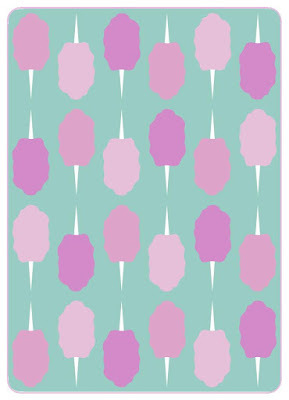 This one uses Shannon Fabric's Rose Cuddle in Fuchsia and Turquoise paired with Kona's Magenta for the background. Using just one rose minky color would be great too! 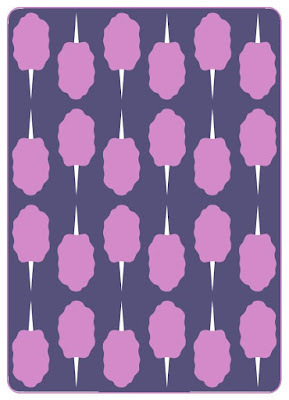 This one keeps the Kona Bright Periwinkle background like the cover quilt. 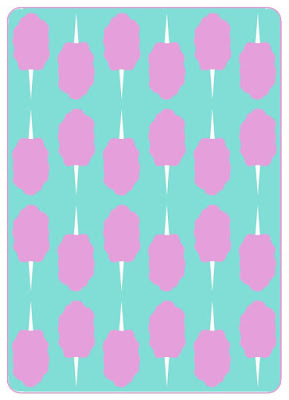 This one color minky version uses Kona Pool for the background. What color combination is your favorite?? Please tell your local quilt shop that you would like them to carry the pattern! 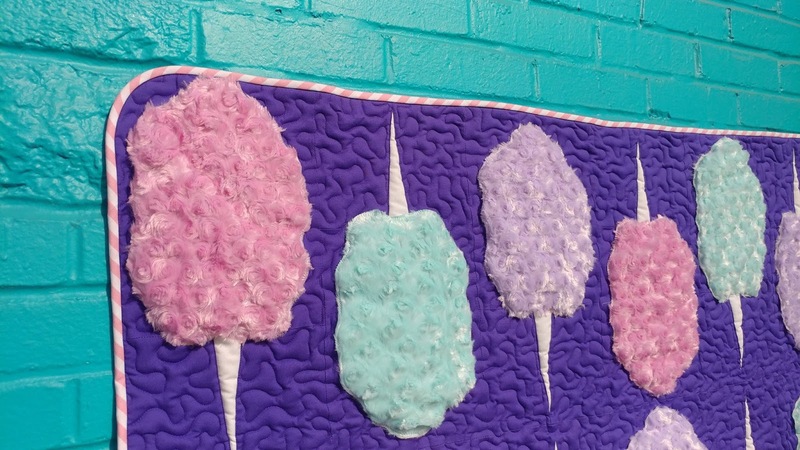 From the pattern description on the back cover, "Cotton Candy is a fun and unique quilt sure to bring a smile to your face this summer! This intermediate level pattern uses traditional piecing, raw-edge applique, and bias binding. Rose minky fabric creates the unique texture and dimension that's reminiscent of the sweet sugar treat found at carnivals, fairs, boardwalks, and baseball games." The pattern includes directions for five quilt sizes: mini, baby/lap, throw, twin, and queen. 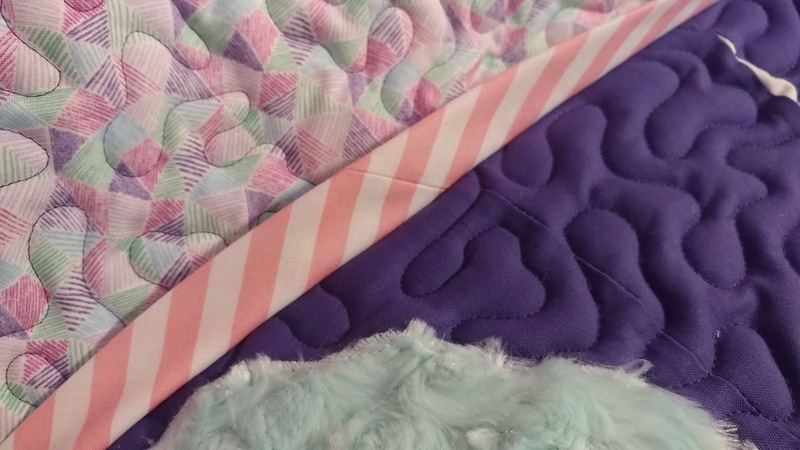 There's still plenty of sewing time between now and summer! Be sure to get your Cotton Candy pattern in my Etsy shop! I can't wait to see what you create! This week is also my turn to host TGIFF! Please link up what you made this week! Linking up with Needle & Thread Thursday at My Quilt Infatuation, Finished or Not Friday at Busy Hands Quilts, Can I Get a Whoop Whoop at Confessions of a Fabric Addict, Friday Foto Fun at Powered by Quilting, Monday Making at Love Laugh Quilt, What I Made Monday at Pretty Piney, Let's Bee Social at Sew Fresh Quilts, Wednesday Wait Loss at The Inquiring Quilter, and Midweek Makers at Quilt Fabrication. Hi, Laura! Your creativity just blows me away!!! This is one super cute quilt which does indeed bring back memories of carnivals and rodeos and sticky fingers!!! Love it!! Sew cute, Laura! 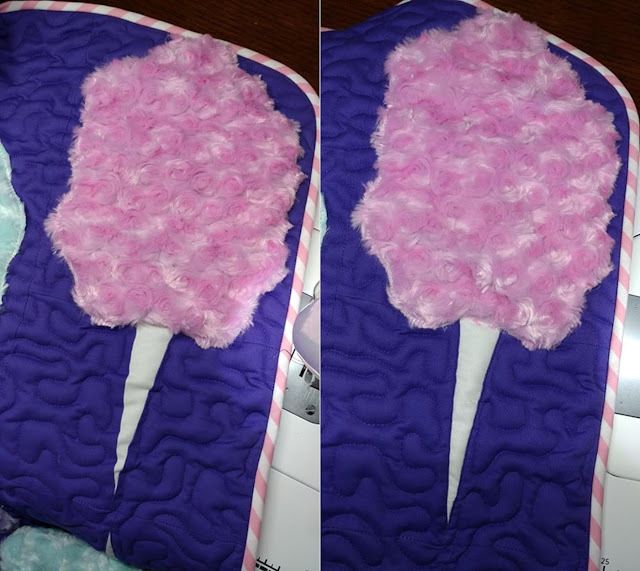 It never registered how much that rose cuddle looks just like cotton candy. Brilliant. My favorite version is the random layout. Any color background will do. What a fun idea for your friend Laura. 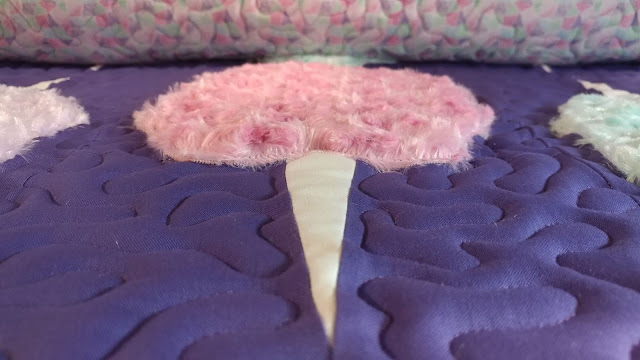 I bet a lot of little girls would love this quilt. I am continually amazed by your creativity. 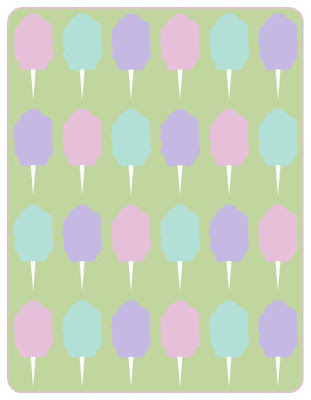 Such a cute quilt and you are a super sleuth when it comes to finding just the right fabric. 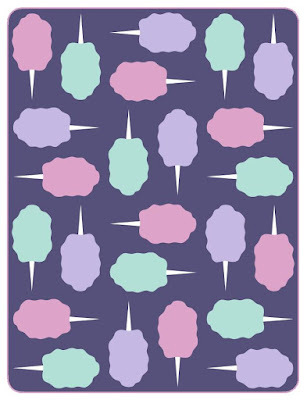 Congratulations on another beautiful pattern. A beautiful and clever quilt. 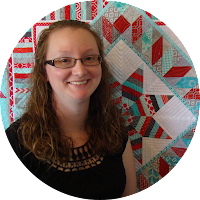 You do a great job at thinking up new and interesting quilts. 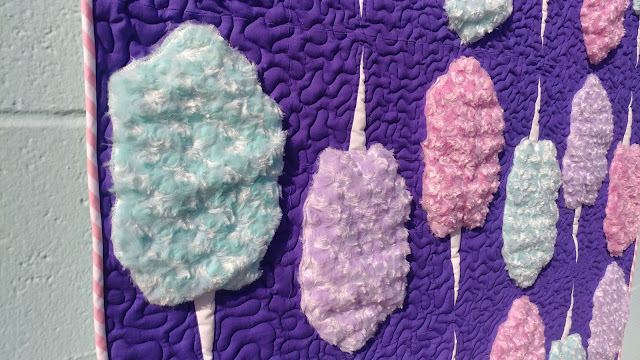 Any child would love to be under this quilt running their fingers over the minky cotton candy. Cotton candy it is!! Perfect fabric paired with the perfect pattern...magic! Definitely want to give this pattern a try! 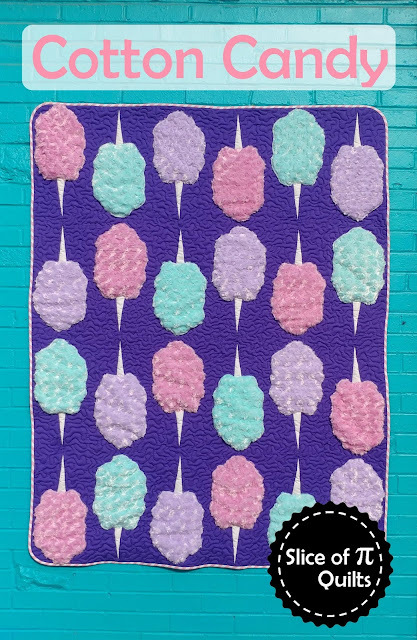 That certainly is a fun quilt! so cute!!! I love the minky! It's perfect! What a sweet (ha! 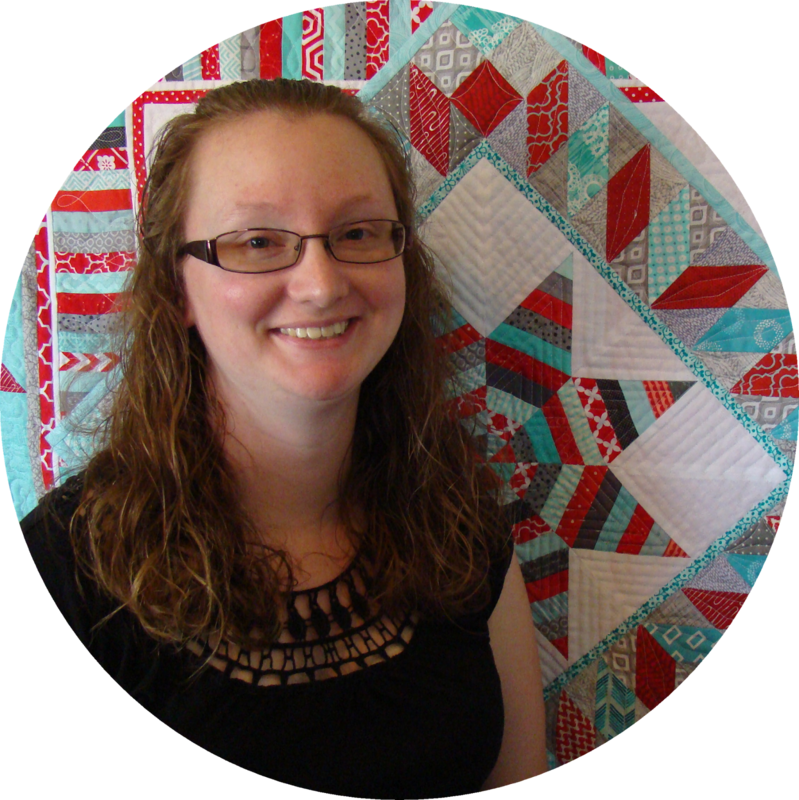 pun not originally intended) quilt Laura! Thanks for hosting TGIFF! Hi Laura, what a great collaboration! Congrats!!! Wow! 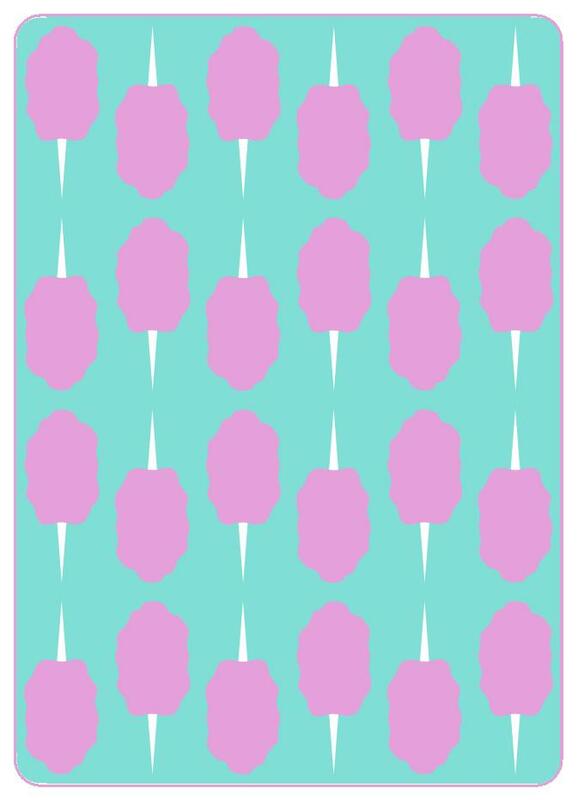 Talk about a sweet pattern! 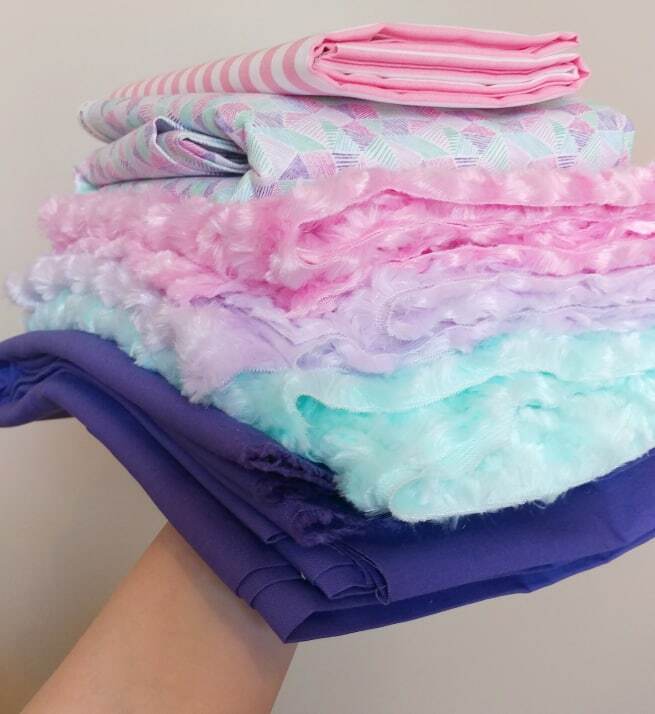 I love all the color variations and that light pink really does look like cotton candy from a carnival!! You're always so clever, and I seriously want to pet that cotton candy. Thanks for linking up to What I Made Monday! So creative. I love the feel of Cuddle. And the rose versions are so beautiful. Thanks for sharing your new pattern on Wednesday Wait Loss. Congratulations.